We were recently watching the Food & Drink show on BBC 2 which is hosted by one of our favourite chefs, Michel Roux Jr. In the episode we watched, Michel was joined by Mary Berry, one of Helen’s favourites cooks, especially when it comes to baking. In the show, Michel and Mary discussed food waste, and we were shocked to see just how much food is binned every year in the UK. It actually made us feel a little guilty, as we are often too quick to throw food in the bin rather than using it before it’s sell-by date. Bread is the most binned food in the UK and as we had bread that was a day out of date, we thought we’d better use it instead of taking the easy option and binning it. Michel cooked roast chicken croquettes using left over Sunday roast chicken and other ingredients that were ready for the bin. This got us thinking, and with bread, potatoes and bacon all ready for the bin, we decided to take a leaf out of Michel’s book and try making some tasty croquettes. This was our first time trying to make homemade croquettes, and it certainly won’t be the last. They were delicious and the coating was lovely and crispy and the smoked bacon filling added so much flavour. It was a lesson for both of us that, rather than simply binning food that’s nearing (or on) its sell-by date; to get it out of the cupboard or fridge and whip something up. You’ll also notice a saving in your pocket in the long term. 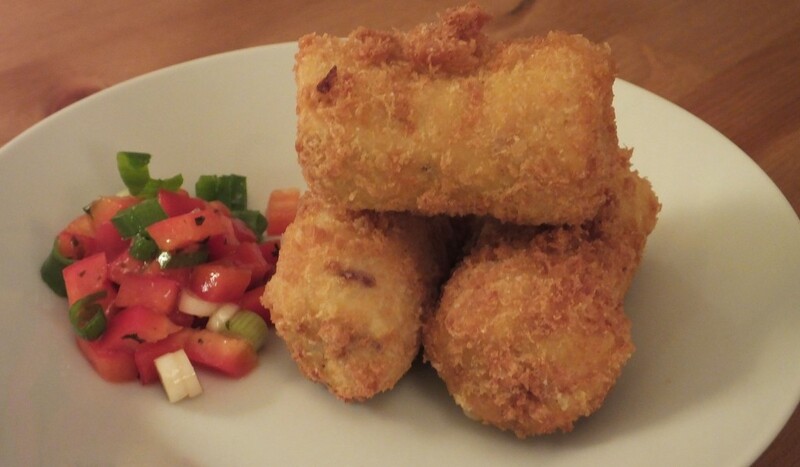 Anyway, enough preaching from us, here’s how we made these tasty croquettes. Makes 12 medium – large croquettes. The first thing to do is start on your filling, and with croquettes this begins with the spud. Peel and chop the potatoes and add to boiling water. Your potatoes will be ready when you can easily pierce with a sharp knife or skewer. This should take no more than 15 minutes depending on the size in which the potatoes have been cut. Once the potatoes are ready, drain them and mash. 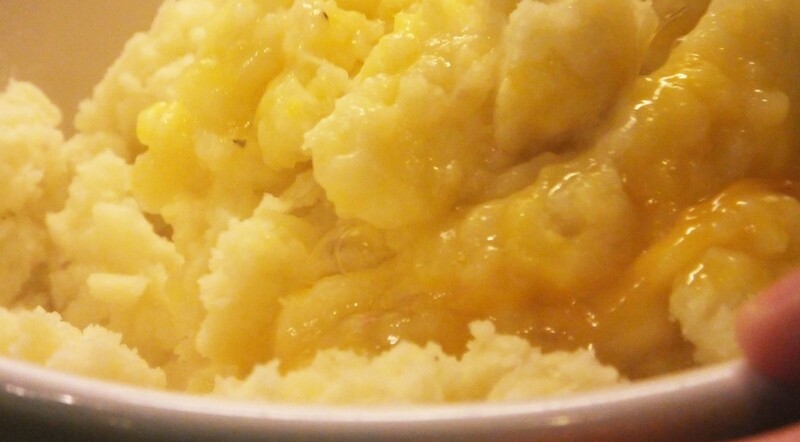 Add one egg and some butter to the potatoes and continue mashing until everything is mashed through. Once this is done, leave your potatoes aside to cool. Preheat a deep fat fryer to 200°C as this will need to be ready for the final croquette mix. 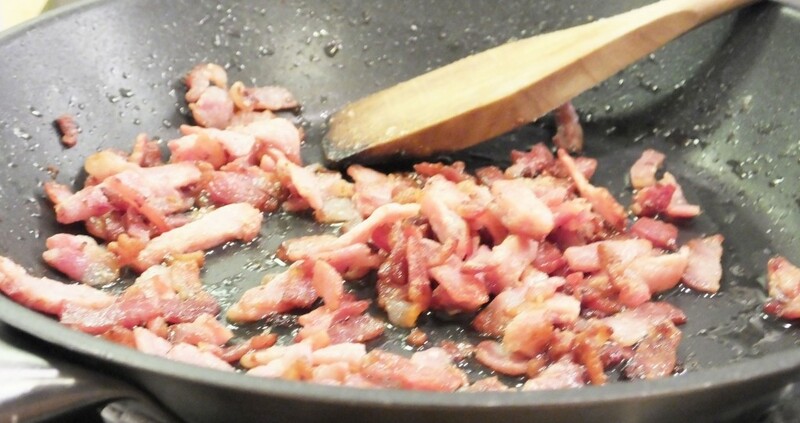 Cut your bacon rashers into small pieces and add them to a hot pan. Fry the bacon until the strips are golden brown. You won’t need much oil here and the bacon should be ready in 5 – 10 minutes. Get your mash and bacon ready, and start to roll into cylindrical shapes. At this stage we added cheese to some croquettes and spring onions to other. This is entirely down to personal taste but added another element to the taste. Season this mix with some salt and pepper. Once you have shaped the croquette mix, you need to deep fry them. There are 4 stages to this process as mentioned below. Roll the croquettes in flour, ensuring everywhere is covered. Dip this into the egg. Roll the croquette into the breadcrumbs. We recommend only adding 2 or 3 croquettes each time to your fryer, to ensure they don’t stick together. Cook for 2 – 3 minutes until golden brown. Keep the cooked croquettes warm by adding to a heated oven (low heat), while the remainder of the croquettes are frying off. You can watch the stages of this in our Instagram video below. If you want to eat the croquettes as they are, or use them as an accompaniment to another dish, then you are ready to serve. We opted for a salsa side with the dish as the perfect snack dip. Simply chop and combine the ingredients listed above, and your salsa is ready to serve. Now all that remains for you to do is serve up the croquettes and salsa and enjoy. 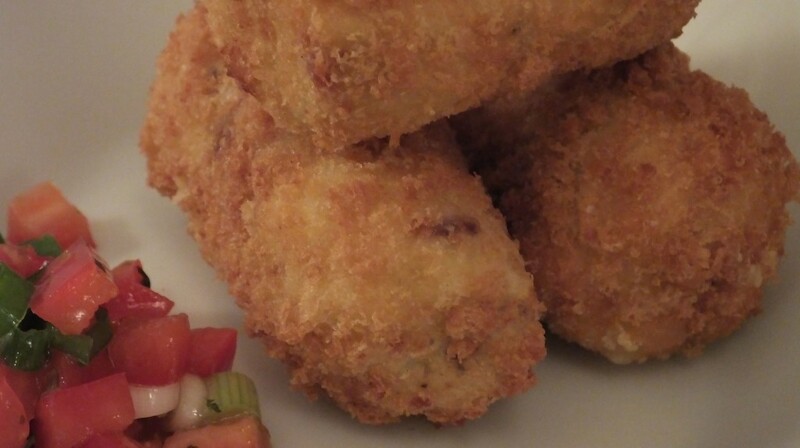 We opted to use smoked bacon, cheese and spring onions with these croquettes, mainly because they were nearing their expiry date, but they are also flavours that we thought would go really well in the croquette mix. We would encourage you to look at ingredients that may be nearing it’s sell-by date if you are looking for alternative stuffing options for the croquette. Here are some of our ideas. Alternatively you could try using a sweet potato stuffing instead of a normal potato. This may even be our next choice, and combine it with some chorizo, such was the success of our sweet potato and chorizo soup. We would really encourage you to try these out guys, especially if you have bread, meats, cheese and potatoes going out of date, and you’re looking for something to try. They make a great snack but also a great addition to any main dish. We’d love to hear from you if you have tried your own. Get in touch with us and share photos or your end result or your favourite croquette flavours by commenting below or connecting with us on Facebook and Twitter.